CHARLES H. RANEY. As Stanton County was not organized until 1887, those men who ventured into the region prior to that date may properly be considered the real pioneers. One of them is Charles H. Raney, a rancher and farmer of Mitchell Township. He arrived in the county on October 25, 1885. With all the obstacles surrounding early agricultural effort he made a success and developed a good farm in the early days, then lost it by an unfortunate business venture, and finally returned, beginning life over again, and is now possessor of a large estate and in comfortable circumstances. On coming to Stanton County Mr. Raney was in advance of his parents, who arrived here the next year. He drove through with a party from Brown County, Illinois, and the wagons comprising the little emigrant cavalcade were about six weeks in crossing the states of Missouri and Kansas. Several neighbors and friends were his companions. One of them was Frank Peters, who became a settler of the same locality. Another was Andrew Hammond, who located here and aided in the development of the county. John Raney was also with the party, and he entered land and spent the rest of his years in this section. Lucy Wyatt, a sister of Charles Raney, was one of the women of the party and entered a claim, proving it up and spent her last years here. Mrs. Mary Tapp, later wife of Andrew Hammond, and another sister, was also of the party. There were three teams who brought these settlers to Western Kansas. Mr. Raney's first act as a settler was entering a pre-emption, a strip of land in two sections, the west half of the southeast quarter section of section 12 and the west half of the northeast quarter of section 13, township 27, range 41. For his first habitation he dug a hole in the ground, fixed it up as a half dugout, plastering it with gypsum and roofing it over with boards, tar paper and dirt. On this claim he remained seven years. He set out trees, dug a well and built a substantial four room house and a barn 24 by 24 feet. He also broke and put under cultivation eighty acres. It can be claimed for Mr. Raney that he succeeded in utilizing his land as a strictly farming proposition, though the live stock which he gathered together proved a prominent factor in making a living. After about fifteen years on the old homestead he abandoned the farm and moved to Syracuse, where in connection with his father he engaged in the livery business. That was the most unfortunate move of his career in Western Kansas. He was at Syracuse three years, and when he returned to the Mitchellville locality he was almost at the end of his resources. To get a new start he exchanged his livery barn for a few head of stock, rented land and with new courage began farming and stock raising. After about two years he acquired other land, paying a small sum for the northeast quarter of section 23, township 27, range 41. It was a grass tract, without improvements. He constructed a half dugout and largely repeated his former experience as a homesteader. Since then he has been promoting the cow and horse industry, breeding the White Face cattle with registered males and handling numbers of horses and mules. He does not take his stock away from home to market, outside buyers coming to his ranch and dealing on the ground. Gradually his herd of cattle has amounted to 275 bead and he keeps about 100 bead of horses and mules. From his original quarter section Mr. Raney has increased his land holdings to ten quarter sections, giving him a ranch convenient for all his purposes. He is cultivating 300 of the 1,600 acres, and his broom corn and grain are a source of revenue as well as his stock. Mr. Raney was about twenty-four years of age when he came to Kansas, and his life up to that time had been lived in Brown County, Illinois, where he was born October 25, 1861. While a boy on his father's farm he attended the country schools and grew up as a farmer according to the lights and methods practiced in the Prairie State. He is a son of James and Sarah (Cordry) Raney, who, as mentioned elsewhere in this publication, came as pioneers to Western Kansas and spent their lives as farmers or as residents of Syracuse. The children of James Raney and wife were: Sarah, who died in Kansas unmarried; Mary, who first married John Tapp and later Andrew Hammond, and died at Kingman, Kansas; Lydia, who first married Arthur Stone and is now living at Syracuse, the widow of Aaron Cole; Lucy, who first married Thomas Wyatt and then John Cahil, and died in Western Kansas; Charles H.; John, who died in Stanton County; and Grant. Charles H. Raney married in Stanton County May 3, 1893, after he had lived here about seven years, Miss Tillie Grace Walters, a teacher of the county. Her father, Squire Walters, spent his life in Kentucky until recent years and is now a resident near Morris, Oklahoma. He married Elzina Layman, who died in La Rue County, Kentucky, where Mrs. Raney was born. Mrs. Raney was one of the following children: Mollie, who died in Muskogee, Oklahoma, as Mrs. James P. Goff; William B., of Uptonville, Kentucky; Susan, of Bucklin, Kansas, married first John H. Walter and is now the widow of F. M. Scarbrough; Mrs. Raney, born June 16, 1871; May, wife of Lee Nelson, of Elizabethtown, Kentucky; Sam J. T., of Morris, Oklahoma; Pearl, of Hodgenville, Kentucky, wife of Asby Ford; and Lena, of Hodgenville, wife of Samuel Hill. 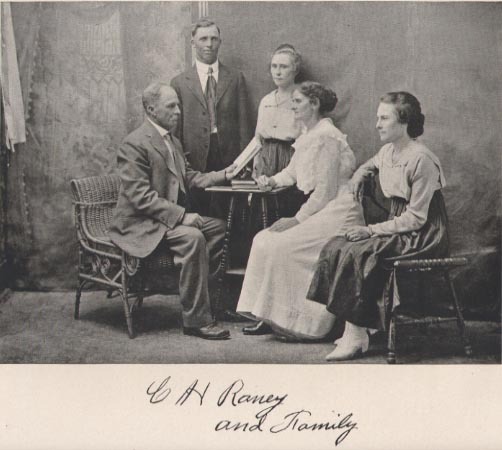 Mr. and Mrs. Raney have three children: Frederick, a rancher and a homesteader here; and Helen and Sarah M., who finished their education in the high school at Syracuse. Mr. Raney has served Mitchell Township as trustee several terms, was a director of school district No. 22 and is the present township treasurer. He is a republican and has cast a vote for a republican presidential candidate at every succeeding four years since his maiden ballot was given to James G. Blaine in 1884. He and his wife and children are members of the Methodist Episcopal Church, and he is affiliated with the Woodmen of the World. He is one of the stockholders of the Kansas Packing Company at Hutchinson, Kansas.